After walking up a series of steep roads to St. George’s Castle in Lisbon I could see and admire these springtime views of the city. Sometimes a challenging walk is worth it! As I looked around there were dramatic changes in the scenery, from rooftops to a bridge and then the water. This arch provided an interesting way to frame the city below. 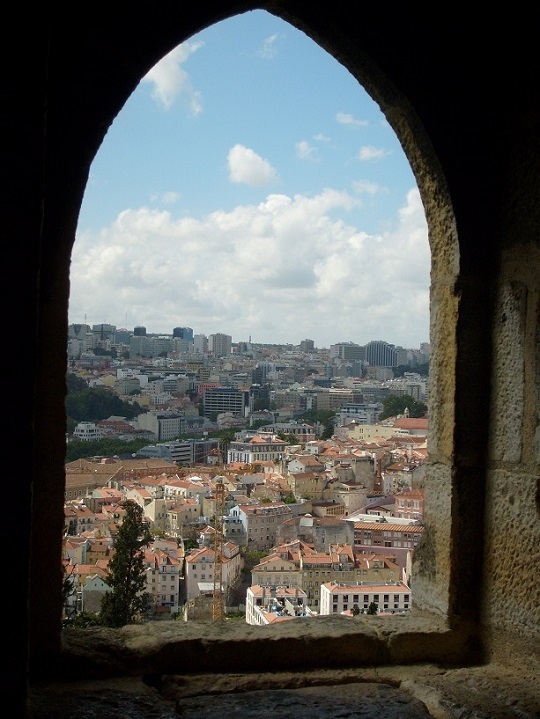 This entry was posted in Lisbon, Portugal, Travel and tagged bridge, rooftops, St. George's Castle. Bookmark the permalink. Beautiful top views! It really gives the viewer the feeling of being top of the world, well done. Thank you Dina – there was so much to see and it was really impressive! Brilliant interpretation of the theme – great photos! With my fear of heights, I never get to see views like this first-hand, but I really love them and enjoy seeing photos like yours. Beautiful! It brings back great memories, thanks! I’m so happy to hear that – thanks Ana! It definitely feels “above” the world. Nice shots. Thank you – it was really impressive looking in every direction! Thanks – that was my favorite too! Thanks – Lisbon is such a beautiful city! Oh one of my favorite vitas on the planet. I found the views breathtaking. Thank you for the visit. Love the shot through the window! Beautiful captures, Meg! The last one is exquisite. Thanks Amy – it was amazing to look out and see that view of the city! Lovely memories for me, Meg :) Thanks for sharing. It really is a marvelous place and I’d like to go back sometime! It was really an amazing view!